Last month I visited a small town in southern Mexico. It is a quiet and modestly prosperous place. Outside some of the homes are older Suburbans, Jeeps and Explorers; the license plates show that their owners have recently returned from the US, driven out by the collapsing economy and heightened nativist anxieties. Almost every family, it seems, has some member who has spent time up north; only a very few of them are still hanging on through the recession. For the most part, Mexicans are innocent by-standers in the current financial debacle. They didn’t allow themselves to be talked into strange mortgages or multiple credit cards; whether north or south of the border, this is for them still predominantly a cash economy. Even for those who went to the US, their key goal was to accumulate dollars and send them south, where, as pesos, they provide the basics and even a few luxuries for many families. Until recently, these remittances have been second only to oil income in importance for Mexico; now both are shrinking fast. There is something more than a little unfair in the manner in which the recession is hurting our southern neighbor. Mexicans, for the most part, have a personal risk calculus that is the complete reverse of ours. Like most people who have experienced hard times, they are not obsessed with the little things that might go awry; they don’t place little flags around puddles in the grocery store, and most dogs have never received a rabies shot. The sidewalks often look as though a tree is trying to push its way through the ground and electrical cables are frequently visible. 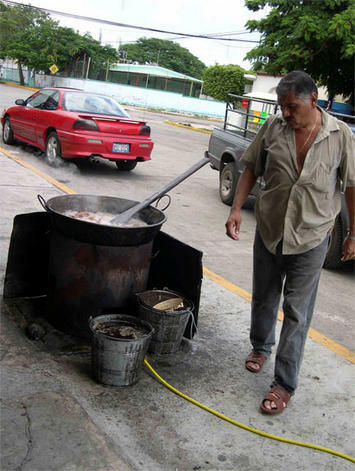 It’s not unusual to see a local butcher frying up vast cauldrons of meats in front of his carnecineria, something that would drive American health inspectors to apoplexy. In contrast to their wealthier Northern neighbors, Mexicans seem quite happy to take responsibility for themselves and don’t expect to sue someone every time they stub their toe. But their collective view of risk is also the reverse of ours. Property is, for most people, something to live in and not something for speculation. Building one’s own home is common but it’s usually done in stages, whenever there is cash to spare. The results may be untidy, with streets perpetually possessing the appearance of construction zones, but there is no evidence of any foreclosure crisis—forests of ‘for sale’ signs are absent, in Veracruz, at least. Nor is that the only visual difference between nondescript Mexican and American cities. Antiseptic zoning is much less common in Mexico, with the result that families live above the store, or behind the workshop, or even on the roof of some buildings. Affluent homes may stand next to literal ruins. In most American cities, this would be evidence of a neighborhood slipping into decay, causing realtors to flee to more ordered areas. But for Mexicans, this juxtaposition simply adds to the sense of being in an organic place rather than on a Disney set. What it means for neighborliness is hard to judge, but it would certainly make an interesting comparative research project. Of course, there are some equivalents to the homogenous subdivisions that dominate the American housing market. I saw several large up-scale gated communities that were standing idle, waiting for better times. I was also shown several housing developments, where government agencies were building terraced homes for state workers. What is striking to the visitor is that these would never be offered in the US housing market, as they would be judged to be unacceptably small. At approximately one thousand square feet, they are half the size of the average American home, (approximately 2200 square feet) and significantly smaller than most new houses. Even though Mexican families are, on average, larger (with more children and more generations living together), the expectation is not that every member of the family gets a bathroom or even a bedroom. It is also common to buy small and build out, or up, as needs dictate and finances permit. Anyone who has traveled in Asia will also be familiar with this phenomenon, which manifests itself in ground floor apartments that encroach upon the street, balconies that become bedrooms and so forth. High density and modest means lead to invention, if not the kinds of appearance mandated by Home Owner Associations or preferred by the fusspot New Urbanist designers. In the past, the Mexican financial system has been criticized for maintaining a tight hold on credit. Even before the current crisis, high interest rates were unfriendly to the consumer, slowing the pace of both urban development and speculation. Given our current crisis, perhaps it’s worth asking whether this points to how the American market may develop in the future. Certainly, we can expect that credit will remain tight for a significant while. The rules for obtaining a mortgage will become more onerous; interest rates will be fixed, appraisals will be exact. McMansions will be of little interest except to large families of means; smaller and older homes will be at a premium. Definitions of overcrowding may change; design expectations will be downsized, and home maintenance will become more usual. As opportunities in the formal labor marketplace shrink, perhaps for an extended period, more Americans will work from their homes and garages, much as occurs in many developing countries. There may also be significantly less mobility, with little or no speculative purchasing. This is likely to have the greatest impact on the condominium market. Even affluent parents will be obligated to keep their college-age kids on campus rather than in condos that they hope to flip after graduation. And even when they have a degree, these young adults – with large student loans, minimal credit and no cash for a down payment – will become used to staying with their parents for longer periods, as is frequently the case in Mexico and other developing markets. This could extend into marriage and even family formation. The condos themselves will, for the foreseeable future, revert to rental properties, catering to those who can no longer maintain a foothold in the owner market. This does not imply that American cities are going to turn into Mexican ones any time soon. But there is much to be learned by studying the ways that Mexicans calculate risk. We might have fewer families borrowing beyond their means, and continually trying to beat the market. And with less aggregate risk in one part of our lives, we might then view other parts of our daily world with a little less obsession with control. We might be a little more relaxed about who lives next door; we might also be a little more tolerant about the age of their truck or the color of the drapes. After all, they might be Mexican, in which case we know that, if they are there, they can probably actually afford it. Andrew Kirby is the editor of the interdisciplinary Elsevier journal “Cities.”This is his 20th year as a resident of Arizona. Submitted by asusquite on Mon, 04/01/2013 - 09:10. A reverse mortgage is a loan for senior homeowners that uses a portion of the home's equity as collateral. The loan generally does not have to be repaid until the last surviving homeowner permanently moves out of the property or passes away. At that time, the estate has approximately 6 months to repay the balance of the reverse mortgage or sell the home to pay off the balance. All remaining equity is inherited by the estate. The estate is not personally liable if the home sells for less than the balance of the reverse mortgage. Submitted by MarkE on Sat, 05/09/2009 - 01:45. Mexico is well known for festivities and great destinations. And according to this, Mexicans are more likely to survive this economic crisis than Americans. That makes their May 5th is Cinco de Mayo, a Mexican holiday a very happy one. There is a recurring myth that Cinco de Mayo commemorates Mexican independence, but the thing is, it doesn't, and we are not going to give that idea any debt relief. The day commemorates a battle in Pueblo, one of the states of Mexico, between the forces of General Ignacio Zaragoza (he won, thus the holiday), and a French expeditionary force sent by Napoleon. (Napoleon Bonaparte's nephew; he had been already digested by worms by this point.) Outside of Pueblo, not many get a cash advance or use the credit cards to celebrate it – it's only in America where people throw a bash requiring mortgage loan modification to celebrate Cinco de Mayo. Religious Freedom or A Tax-Free Ride? Time to Hate Those HOAs (again). Could the Dallas Way be the Right Way?